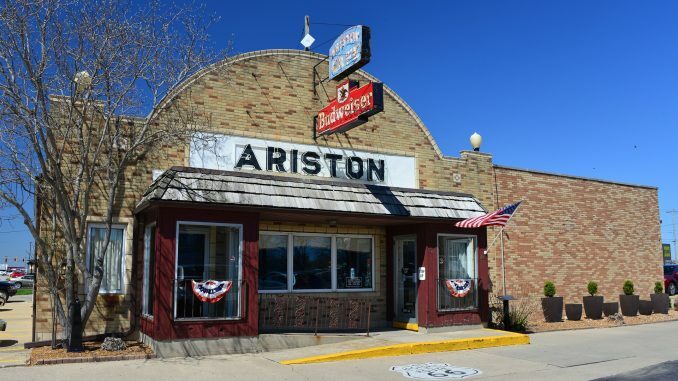 The Ariston Café is a historic restaurant located in Litchfield, Illinois, along U.S. Route 66, and is the longest operating restaurant along the entirety of the highway. Added to the U.S. National Register of Historic Places in 2006, the Ariston Café is one of the oldest (if not the oldest) restaurants on Route 66. In 1992, the Ariston Café and the Adam family were inducted into the Route 66 Hall of Fame. The Ariston Café in Litchfield was built in 1935 for original co-owners Pete Adam and Tom Cokinos, both of whom were of Greek origin and already experienced restaurateurs in their own rights. Pete Adam had previously operated the Ariston Café in Carlinville since 1924 and after the 1930 highway realignment moved U.S. Route 66 in Illinois further east began building the current location to better take advantage of the increased motor traffic. 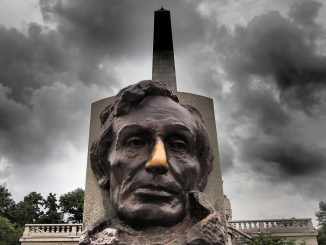 The work was completed on July 5, 1935. Designed to be utilitarian, the café does not follow any single architectural style. Though there was no particular style guide followed in its construction, the Ariston Café has an art-deco vibe that is not uncommon to buildings of its age. The Ariston Café has been family owned since 1924. The address is 413 Old Rte 66 N, Litchfield, Il 62056. The original café was located in Carlinville, Illinois along U.S. Route 4. Original owner Pete Adam immigrated to the United States from Greece. The café and the Adam family have been inducted into the Route 66 Hall of Fame. 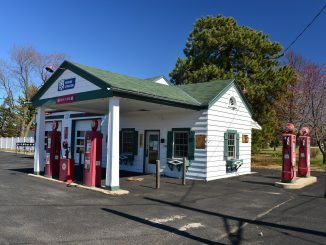 Like many Route 66 businesses, the café was once also a gas station. Originally, the Ariston, like many Route 66 businesses, had two fuel pumps fronting it. The Ariston Café was listed on the U.S. National Register of Historic Places on May 5, 2006.